M&C Chairman Leng Beng Kwek(8th from left in 2nd row) poses for a picture with 30 M&C CEOs and one of the authors of the Blue Ocean Strategy, Prof. W. Chan Kim (7th from left in 2nd row). 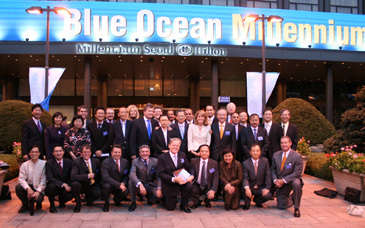 Millennium & Copthorne Hotels plc (M&C), a world leader in hotel management, held its Blue Ocean Strategy meeting at the Millennium Seoul Hilton Hotel in Korea. 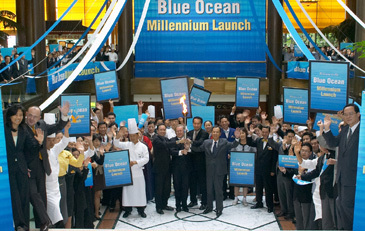 For three days, from August 23 to August 25, 2005 M&C, the London-listed hotel arm of the Hong Leong Group, held its Blue Ocean Millennium Launch at the Millennium Seoul Hilton Hotel. world to discuss the Blue Ocean Strategy, authored by Professors W. Chan KIM and Renee MAUBORGNE. KIM was on hand to discuss the strategy and how to implement the strategy in M&C hotel properties to meet M&C goals. KIM and MAUBORGNE co-founded the Value Innovation Network (VIN), a global community of practice on the Value Innovation family of concepts that they created. KIM is also a board member of Value Innovation Action Tank (VIAT), a non-profit organization, which has fifteen Singapore government ministries and agencies as founding partners. On August 26, the staff of the Millennium Seoul Hilton gathered in the lobby of the hotel to pose for a picture to signify their readiness to implement the Blue Ocean strategies, and to proceed in their jobs with a Blue Ocean Strategy mindset. Millennium Seoul Hilton's staff gather in the lobby for a camera to signify the implementation of the Blue Ocean strategies. The Millennium Seoul Hilton is owned by City Development Ltd., one of Singapore's biggest-listed property pioneers, and operated by Millennium & Copthorne Hotels plc, which operates 95 hotels in 16 countries, making it the 35th largest hotel group in the world and Singapore's largest international hotel group. Both companies are subsidiaries of the Hong Leong Group, one of Singapore's largest local private sector conglomerates engaged in a wide range of business in Asia-Pacific, Europe and North America. Blue Ocean Strategy provides a systemic approach to making the competition irrelevant. moves across a host of industries, Blue Ocean Strategy highlights the six principles that every company can use to successfully formulate and execute Blue Ocean strategies. The six principles show how to reconstruct market boundaries, focus on the big picture, reach beyond existing demand, get the strategic sequence right, overcome organizational hurdles, and build execution into strategy.